Tag "Dial H for Hero"
Dial H for Hero is a DC Comics property dating back to the 1960s. The concept was that Robby Reed possessed a magic dial which enabled him to dial up a super-hero identity to handle whatever emergency may arise. Readers were invited to submit heroes for a one-time appearance, and given full credit for the creation. During the more innocent days, it was a viable idea, but as comic fandom became more sophisticated, it faded – much like the rotary dial. DC Comics has tried to revive it over the years, but with little success. This time the series features teenage thrill seeker Miguel. As a small child, he was rescued by Superman. Now, years later, he’s the unwilling lackey in his uncle’s failing business. Is it any wonder he’s easily influenced by the local small town bad girl? 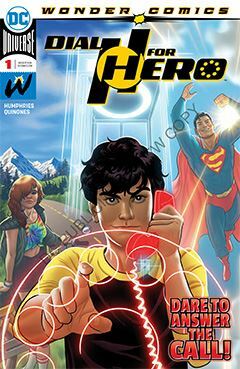 In need of rescue once more, but instead of Superman, Miguel is “gifted” with a magic red telephone, and a voice urging him to dial H. The dial sends ripples throughout the DCU, while at the same time turning Miguel into a new super-hero. No doubt secrets will be revealed in coming issues, as the magical dial’s impact is felt throughout the DCU. But I have to wonder, with the growing powers of magic within the DCU these days (Shazam, Raven, Dial H), what exactly does this mean. Answers will be forthcoming.